Rubber Room Ramblings: IT IS WEEKLY DEAL TIME AGAIN! 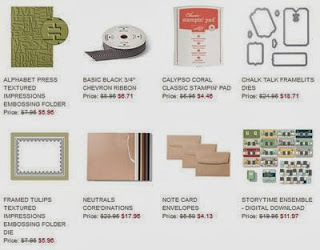 I love a good deal, and this week Stampin' up! is offering deals on some great items! The Chalk Talk Framelits are one of my favorites, and, of course, everyone loves an Embossing Folder and Ribbon... These deals disappear on January 20th at midnight so order now and save big!